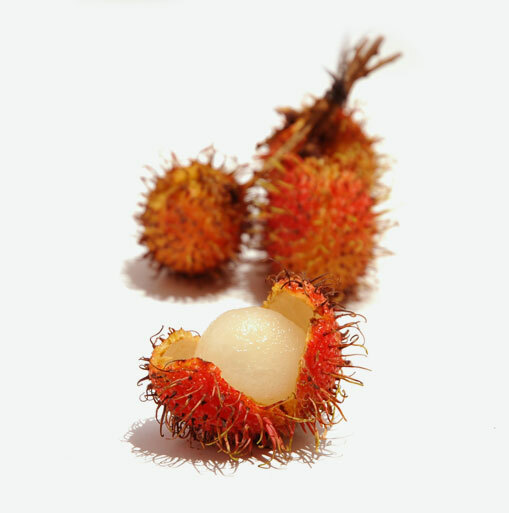 The lychee is a fruit that has its origins in southern China. These tropical fruits are oval in shape and measure just over one inch in height. They have a thick, dimpled skin and are a brownish red colour. Although they have thick skin, their skin is soft and peels easily revealing a brilliant white flesh. The lychee fruit is sweet and delicious. Lychees are a rich source of Vitamin C, as well as calcium, potassium and phosphorus. Vitamin C helps the body to fight heart disease and cancer. The calcium and phosphorus in this fruit are beneficial for strong healthy bones, healthy skin and tissue. Potassium is beneficial for helping to maintain healthy blood pressure. When choosing fresh lychees, pick fruits that have a rosy-looking skin and are free of blemishes. The skin is naturally tough and leathery, but it should be pliable and not overly dull, dry or dark. If the fruit tastes bitter or sour, it is not ripe. Unlike some other fruits, after lychees are picked, they do not continue to ripen. When you take lychees home, store them in a plastic bag in the refrigerator and eat them within five days. When you are ready to enjoy lychee, simply peel the skin and eat the white, juicy flesh on the inside. The seed in the middle of the fruit is big and black, and is not edible. Try lychees in fruit salads, chutneys, eaten fresh out of hand as a snack, or make sorbet with them by placing 3 to 4 cups of lychees in an airtight freezer bag. When lychees are frozen, remove the skin and pit. Place them in a food processor and process until smooth. You can add a couple of tablespoons of milk or coconut milk to make the sorbet creamier. You can also use lychee to make jams and jellies.